Welcome to UAE LABOURS Free Community Blog, this post will cover how to lift absconding case in UAE from home country. From the day this Free Blog is created we have been contacted by almost 80% of desperate employees mostly from Philippines, India and Pakistan, who have been listed or facing Absconding cases. As per our visitors they were wrongfully listed in Absconding cases by their companies or sponsor’s, they are constantly asking below questions through Email, Private messages and Comments. 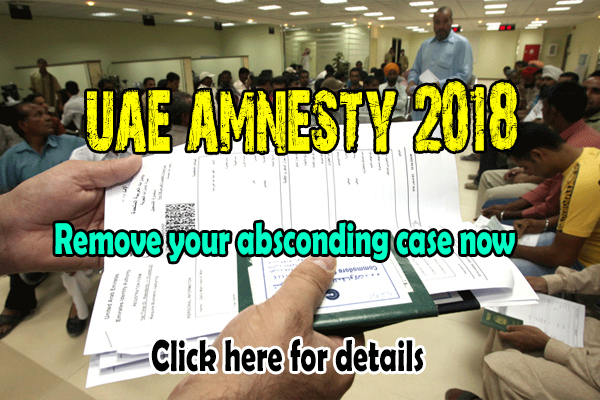 we cannot answer everyone that’s why we have decided to write a legal way regarding “How to Remove Absconding Case in UAE”. 1. How to Remove name from Absconding Case? 2. Is there any chance for us to visit UAE Again? 3. We wasn’t involved in illegal activity but our name listed in absconding people, why? 4. Is there any way to clear my name from Absconding List? 5. How to clear Name from Immigration system? 6. How to Remove name from Police case in UAE? 7. How to remove immigration ban in UAE? 8. How to remove lifetime ban in UAE? 9. How to remove name from absconding case while living abroad? 10. Can I remove my name while living in Philippine, India or Pakistan? Note: This Article is for those who already exit and were unable to pay DEBT & listed in absconding cases by BANKS and other Financial Departments of UAE. You can remove your name from Immigration system and also from police case by following below Guidelines. Important: Please leave your comments below with your case details (Type of your abscond case) for possible solution. We will try to reply and update our readers with the best way to remove name from absconding lists. A Person who leave a country or his/her job permanently without informing Company (employer) & cancelling the UAE Residency with their sponsors will be categorized as absconding and may receive a ban. How to Remove name from Absconding case while paying Dues/Debt from home Country? 1. If you already leave the United Arab Emirates with an outstanding debt (dues), contact your bank through Email Address, Landline or through Toll free Numbers and tell them your financial situation. 2. Ask the available settlement options by following their terms and conditions. 3. Inquire the minimum settlement amount for one-time payment in or choose the option that suits you best. 4. After confirming the settlement options, request a settlement letter. (Please note that never pay anyone without documentary proof). 5. Comply with the settlement agreement by sending money directly to the bank from your country bank account, money transfer firms or as fixed between you and the bank. 6. Once you have fully paid, request a clearance letter on Bank original letter head with stamp and Branch Manager Signature. 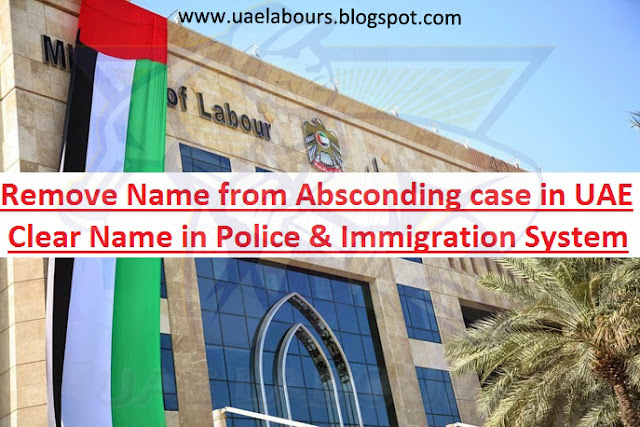 How to clear name from UAE Immigration and Police Case? In-case if you have a police case or your name listed in Immigration system, secure a clearance from the bank legal representative (bank’s lawyer) as proof that they have cancelled the case. Present the same clearance letter to the police station so your name and previous records can be remove/clear from police and immigration systems. What if you are out from UAE? If you are not in the country, your representative can do this for you by taking confirmation letter from Police or Immigration officer. Note: Please Like us on Facebook for more Updates as Related Articles regarding Legal solutions of absconding cases with full procedure will be publish soon. Please leave your comments and FAQ’S below, your queries will be answer soon. I have absconded case my sponsor file me absconded due to leave the job without informing my sponsor .. I used to work in Atlantis hotel , I tried several times to contact them and asking them to lift by ban but they are not cooperating,i need someone to help me lift my absconded case . Sorry Mr Zouhair, As per UAE Labour Law A Person who leave a country or his/her job permanently without informing Company (employer) & cancelling the UAE Residency with their sponsors will be categorized as absconding and may receive a ban. You tried illegal way to leave country that's why you are in Trouble, we will suggest you to Send someone (friends, Relatives) to the company address. For more write us back. Name in police and immagration? I dont have anycase just that abscondy! How will my husband help me to go back there if he work in Emirates Airlines or we are willing to pay to clear my name. A person who exit country and didn't came back or leave job without informing company will get automatic abscond case and may face ban. To check your current status, apply visit or Tourist visa, if approved you can enter UAE and can check your profile at immigration. I'm Mallikarjun from India. I had worked as a pest control technician in UAE.I had cancelled my visa last year July 13 2015. My told me that they banned me for one year because of not completing my contact. But this month I have offer from other company. How can I lift my ban please help Sir..
You can enter UAE once after completing your ban period, your maximum ban period will be 1 year. Count the days from the date of exit on UAE Airport, you can apply for visit or tourist visa even if you have Labour Ban. I was a employee visa and i worked in shipping company as name Hope Shipping LLC in Dubai ..
After i joined my company my employer abcond me on MOL but after completed 2 years on cancellation time i knew about this case and my sponser told me this will happen wrongly with me and he come with me on MOL for cancellatio time 16 feb 2014 for remove my abscond after waiting one hour desk person tell us to take letter from tasheel centre with the name of Talab form..
After filling and submit the talab form to MOL then MOL give us 15 days ..
but after cancel visa i have come on my home country Pakistan on date 17 March 2014..
After 2 months i have apply visit visa but visa reject due to band ..
but now i am in trouble my employer also busy in so many works and he also go to MOL and resolved my issue with the form of apologize but not response now 2 years passed..
kindly resolved my this problem i have no any criminal record only small abscond case ..
if any solution kindly advise me on my email or number.. I'm writing the details here to have smooth correspondence. My brother got his visa from the agent in almost 2 lakh (PKR) who got it done through a UAE national. The agent had only taken a temporary visa for 2 months but he did not inform us about it. We were told that the visa is permanently taken. After those 2 months, the Visa issuer UAE national went to the police station and stated that my brother is illegal and should be sent back. My brother was kept in jail for 16 days and when we inquired about it and met the visa provider, he told that the agent had only taken visa for 2 months and was then not answering phone calls. He also said thay it was essential for my brother to leave UAE once, before he could get another visa. I want you to look into this entire thing since he is facing difficulty in getting the Visa and he had invested almost a million in his business there in UAE, which would then turn out to be a complete loss. I hope you will deal with this as a priority and sort out the issue. You have invested Millions in your business but didn't confirm or check your visa? It really hurt to read cases like yours, anyhow where is your brother now? Which state visa was that? good day! UAE LABOURS! I would just like to inquire about my case, On year 2009 i was employed by a government owned company in abu dhabi for a 2 years contract but unfortunately after 6months of work i need to leave UAE for a very serious family problems in my country and i wasn't able to contact my employer when i was in my conuntry that i could not come back anymore to UAE. On November 2015 i ask my friend to apply for a visit/tourist visa for me to Dubai and the result of the application was rejected, i dont know what is the specific detail of the rejection.. I hope UAE LABOURS could help me in my case.. i can send my passport details to your office if requested..
You will face Labour ban if didn't completed your contract period, If you were deported by company and involved in any criminal activities, illegal acts against company properties etc, you may face Abscond case and can not enter UAE once it remove from system by Immigration. this is me Salman from Pakistan.last year I was offered by an engineering company at Dubai.I joined it as an Architect.but unfortunately I got a few spots on my chest x.ray due to this reason i was deported and banned.An immigration officer at Dubai airport told that you have 1 year ban.But my PRO said you have lifetime ban.kindly clear me about my ban duration.and let me know, can I get enter again to UAE? Individuals with HIV, Hepatitis and TB can not enter UAE anymore once they have deported and get scanned at airport, if your test reports are clear now, apply for visit visa and try your luck. After approval of Visit/Tourist visa you can enter UAE and can re-check your self at UAE Hospitals or Government Medical Labs. Thanks received email and i have already replied you..
please confirm after getting NOC how i will submit on Immigration desk while i am in Pakistan.. I love Dubai and miss a lot .. I need to come back in Dubai Peaceful country.. I am Indian,worked there in UAE Fujairah Free-zone company from 2000 Aug to 2007 Oct as a machine operator.When I asked about my arrears of HRA etc.the company told me to sign the papers as I received all these.I refuse to sign the papers with out receiving the payments and they terminated me.They given me a notice period letter not to come to the company from the letter said date.From the day I am not going to the company and I am ready to back to India in a month but the company didn't returned the passport and delayed to return my passport for another few days.After one month they paid all my arrears and I asked the passport they told me to report to immigration department.There I went and reported then only I noticed that they filed an absconding against me.This I noticed just two days before my passport expiry.Then I don't have time to think and only two days left in passport ,my wife was pregnant and she cannot travel after that days.They scanned my eyes before leaving the country. Now I am in Qatar, I just want to know shall I get a visit visa for UAE.I speaked with the old company,they dont have any objection for getting me a visit visa.What are the procedures to clear this issue.How do I know weather my ban is existing. Hi im loren and i home now in philippines.before my madam bot make residence visa for me and i work in here saloon for 7mnths and i reported here to the labour for not giving my residence visa.and i won the case..aug. i'm all about to leave the country i pay my overstaying and when i was in the emigration police catch me they thinking that i'm gonna run on my abdconding.and i explain to them that my case was already done and i also pay my overstay i show them the papers i have but they send me to al whatbah emegration.and they said i'm now lifwtime banned in UAE i want to go back but i cant.please help me to remove my case i'm now in Philippines thanks and god bless. I have been working in Dubai , i got personal loan and credit card which i used almost fully. few months back i lost my job and due to which i have serious problem in paying loan installment and credit card (Credit card i keep paying minimum). Now I have nothing to pay against credit card and personal and Bank keep calling me and threating me to pay installment amount. Is it possible to stop payment for some time to avoid interest and i will pay later once i got job. kindly guide me the best solution regarding loan and credit card payments. Dear Sir. I have a emigration ban due to HEP C.
I s it possible to remove and back to UAE. As per my knowledge Hep C not suppose to be Banned. Hi sir! I'm came here last Sept 12,2015 as tourist visa my employer take me from the Philippines.but we have a problem in the time of slep alws late and I got accident there,i ask them to quit but they don't let me.they use my tourist visa and after that they renue me as tourist visa again after my four months they make me servant visa I my servant visa start at Feb 10 2016 but because of luck time of sleep I ask them to quit but they ask me 50,000 derhams to pay them,but I work 6months already to them.i decide to run away go embassy but my agency here hide me for 2months and half they promise me to settle my problem,but after all they do nothing and my employer told me that they already absconded me. I am the victims of human trafficking sir.how can I solve my case I can't find job and I don't have Emirates i.d also. Pls advise me tnx. Hi sir! I'm came here in dubai last Sept 12,2015 as tourist visa my employer take me from the Philippines.to work with them as housemaid. but we have a problem in the time of slep alws late and I got accident there,i ask them to quit but they don't let me.they use my tourist visa and after that they renue me as tourist visa again after my four months they make me servant visa I my servant visa start at Feb 10 2016 but because of luck time of sleep I ask them to quit but they ask me 50,000 derhams to pay them,but I work 6months already to them.i decide to run away go embassy but my agency here hide me for 2months and half they promise me to settle my problem,but after all they do nothing and my employer told me that they already absconded me. I am the victims of human trafficking sir.how can I solve my case I can't find job and I don't have Emirates i.d also. Pls advise me tnx. Hi..i was terminated in my old employer and it says i wont be having a ban..after one month my visa expired but my new employer haven't finished processing my visa since they were having a problem with their license so they advised me to pay for the penalty everyday until the application will be approved. But after 14 days of paying the penalty, the immigration told me that i am blacklisted. After checking in the main office of the immigration they told me that the old employer filed an absconding case against me..is it legal for them to file an absconding against me even if i am paying my penalty everyday?. My uncle was employed by my sponsor to his company, then he was promised a labour visa, when they didnt had a slot for hin they applied him for a servant's visa. Unfortunately, his medical showed possitive fo TB and failed, but we requested for a thorough examination for the reason that he have passed past and recent medical tests for other countries employment procedures. The sponsor promised to fix everything and said he would use his local connections. Only after a few months he was informed that his visa is not released and he has to surrender himself in immigration for depotation. Having no choice, my uncle agreed to go home instead of living here illegaly. But the immigration said he will have life time ban. Now, her daughter is currently wprking here, we plan to invite him to visit dubai again but how? I f he has a ban. Is there a possible way to fix this problem? I've done my sentense for bank case in jail here in UAE,and i had Absconding case also,,after I finish my sentense in jail,,they send me to imigration for immediate deportation,but when Police send my passport to imigration,they saw that i had a travel Ban from the bank that file me a case before thati already serve in jail,thats the bank demanding for the payment to remove the ban,so now I was stuck here in UAE.I had Deportation case at the same time I had a travel ban to prevent from exit the country.My question is can i appply for a new Job here in UAE and take a new VISA so I can start paying the bank? I lost my job since nov.last year and i have a credit card now they file a police case i connot leave the country because i have a police case now i am over stay..
company of my friend give him a lifetime ban, my friend is wondering why he has a lifetime ban since he didn't commit any serious crime. He was cancelled with cancellation letter from labor and NOC from the company, how are we able to removed his lifetime ban case and is there any possibility he can come baack and work here in UAE. Please help us to resolve his issue since he was already one year out of UAE. Hello. I have an immigration ban due to absconding case with my previous company in Sharjah way back 2014. First, I didn't leave the company by will. They terminated my contract and advised me that they will assist me in cancelling my UAE residence permit (during this time I underdtand that they didn't cancel my visa yet).They given me a chance to look for a job, I did found a new job, however my second employer didn't manage me well (that's another story). After a month, I received an email from my first company asking me to surrender my passport and was advised that I need to exit UAE ASAP as they already cancel my permit and that they are trying to contact me to let me know of the situation. I find it not true, as I didn't received any call nor message/email from them (probably personal reason, as our HR manager is my Uncle). After receiving that email I immidiately contacted them and cooperate. I even asked help from one of our legal councilor from POLO Dubai who help me to go home (Philippines) and lift off my over stay fee- I wasn't aware that I am an illegal immigrant during this time, all I know is my visa is still valid. During this process, I found out with the help of that legal councilor that my company filed a case against me for Absconding resulting to Immigration ban, in which I didn't even do (leaving the company). I tried to contact them several times and even send my representative to ask for an explination but our HR manager kept on blocking our messages and replying with unproffesional notes about me. The last time we checked with Sharjah immigration, it is a confirmed case if absconding that resulted to immigration ban. I wanted to go back in UAE so bad so please help me on how I can retract my case and how can I lift off my immigration ban. case .I still want to work.I have 3 children is studying.I found a employer but they want to clear first my name in blocklist.I ask someone again to help me to my problem.But they said i need to pay 13,000 aed for the case absconding and 13,000 aed for overstaying.But i don't have that big amount.I hope you can help me it is almost one year.I want to stay and work here legally. Hello! Good day.. Im now in Philippines, i was a housemaid in abu dhabi in 2013, after a year i ran away from my employer becoz of maltreated, and for more than a year i was outside, i work part time for me to survive untill i decided to go home on june 2015, i surrender myself in al wathba, until i found out i have absconding case, i was jailed for 2months and was deported on august 06,2015.. I want to ask if i still can enter uae to have a legal job, if i have ban or blocklist, is there any way to enter again uae as legal worker? Pls i need your response...thanks and more power! Good day! I don't know if this is the right website to ask this but I'm hoping to get a response from you. I was deported just this month from Dubai because of my medical result which is OLD TB but inactive. But before I left, I did second opinion and took another X-ray and the result is Normal. I asked the Director Head of the hospital where I did my 1st medical and he told me that they will not accept the result from my 2nd X-ray outside their facility. I really can't believe that I have an Old TB that's why I took another X-ray. Is there any chance or way for me to go back in Dubai this year? please help me. Thank you so much! good morning my wife is having abscond case just because she going vacation and did not come back to employer more than 1 year from now ,i want to her back for tourist or visit visa it is possible ?what can i do about that? hi, i have abscond case when i was single, it is possible for me to come back in UAE using husband visa? thank you and GOD Bless. hi there.. i would like to asked how to know if there is immigration banned by etisalat /du credit balance?do we can go out for vacation even there is remaining credit balance?? Hi, I have some queries regarding my ban and I want to know how to contact the UAE Labour Mail ID who have given the answers to all the above questions. Please give the E Mail ID to the below address for which I will be very thankful. Good day, I want to ask how to remove my ban I'm still in use. Hi, I have worked in Dubai and came back 9 year ago. I had few bank loans and credit card payments. I cleared all of them from my home country. Only one bank loan payment is left and collecting agency and the bank has agreed to give me clearance letter after I pay a certain amount. I checked with immigration through a resource and they said that my name is clear and I could travel so I applied for the visit visa and got it. Tell me is possible that once I travel to Dubai I would get arrested at the airport ? Or collecting agency just bluffing with me? Would appreciate your proper guidance. Thanks. Good day to you all of you am Christopher Miles, I'm from USA, Texas, am very happy as am writing the testimony how i got my loan from this loan, i believe God has a plan for me, after i was been scammed of my money by many so called loan lenders, i was deceived and almost thought to take my life, but God has a purpose for me, if you want to get a loan from any company you have to chose Mike Johnson Firm, when i was first started with him, thought he was like the rest, and to my Greatest surprise i got the loan of $69,000.00 in my account and that was the Exact amount i applied for in his company, and you that is feeling that there no hope for you? is a lie because if you interested in getting any type of loan, you can contact him via email, his email is: mikejohnsonfirm@yahoo.com, God Bless you like he blessed me with Mr Mike Johnson by getting my loan after been falling in the hands of scams. Hi there, my employee went for annual leave but did not return from the annual leave and its 3 months already. I was told that we need to wait for 6 months before cancellation. Is there any possibility that we can cancel the employee and use the guarantee for another employee. Hi! I just want to know if any chance to remove my husband blocklisted (absconding case employment visa not stamp on the passport in 2013). He has been deported retina eye scan done in Abu dhabi in 2014. I am living in Dubai with our baby. It’s not easy to raise a child alone, my daughter also need her father as she is growing up without seeing her father. was searching for help on the internet to get my ex lover whom will got divorced back, i came across this wonderful man called DR.AGBAZARA of AGBAZARA TEMPLE who did a nice job by helping me to get my divorced husband back within 48hours.. I never believe that such things like this can be possible but now i am a living testimony to it because AGBAZARA TEMPLE actually brought my lover back, If you are having any relationship problems why not contact DR.AGBAZARA TEMPLE via email on: ( agbazara@gmail.com ) OR on ( agbazaratemple@yahoo.com ), Then i promise you that after 48hours you will have reasons to celebrate like me. Hi sir I have absconding on me more than 1year. My visa cancelled from the company and I didn't exit. Around 2 month after he type the paper for removing absconding he got fight there in immigration because he was standing on wrong lane they took his ID and check in the system warn him and told him to go so he left,I took documents and I stand on the lane he checked and he rejected. Than I go out and check the solution people told me he who make absconding he only can remove, than I told the owner he make reason that he will come but didn't come now more than 1 year past. I requested lot of people they waste my time only. hello auhtor:i just want to ask if posible to remove my ban?my case is abscond i want to come back uae my husband want sent visa for me.please help me i need ur help what we can do to remove my ban?thank you..
My previous company has filedfiles absconding case against me. I have been terminated by them in February 2015 and was already in financial distress at that time due to my wife losing her job. My passport was kept by prosecution related to another case and they were unable to cancel my visa in time hence them filing absconding case. I have been stuck here without income an moving from friend to friend for place to sleep.I have communicated to them that my passport was held by the authorities but they insisted me putting another passport down as guarantor. After almost a year I was finally able to get my passport back after paying 10 000 dirham fine to court but when I went to police station to take passport receipt I was detained because of this case. Kindly advise how I can deal with this and have this case withdraw from my name. This is the only obstacle now preventing me from getting my passport back and finally go home. Sir few months ago i had a police case regarding on bank debt also I paid half of the amount to the bank and the bank have added with interest which is so huge that I cannot afford to pay and I have cleared it through Dubai court...but the bank is still following me time to time,plz tell me the best solution. last Nov. 2015 I sumbit non-renewal letter to my previous company because I don't want to renew my contract with them which is to be end on Nov. 19,2015 but they cancel me before that date so now I'm facing a labor ban. I cannot apply in private companies unless it's government. I dont have the chane to get a new job until my 1 month noticed end on December.. So i dont have the chance to change my status or leave the country,I've tried to apply in one government company but visa application is rejected due to absconding case.. Now I'm 8 months over staying,now my mother is worried and got sick because of my situation hefe now.I want to go back home in my country. I don't want to stay here anymore..what should I do? Please help me. I need your advice and help regarding this matter.. I'm looking forward of your response. Have a blessed morning..
My name is Muddasar Kamal From Pakistan. My name is also listed for one year in absconding people by MOL. I took 7 leaves from office without notifying them so my sponsor file case against me. 6 months passed. There is any way to get out of absconding list..
Year 2014,i was deported because of overstaying,,that time i was also jailed for 3mos. and they sent me in my country month of April.. by the same year, month of Aug. i had a chance to came back UAE by visit visa and got a job.. i was employed and have working visa but it happens that my company faced bankruptcy so my employer ask me to cancel my visa so he can adopt me to his another company.. i was cancelled and exit in Oman but the time i need to enter again in UAE,immigration in Oman border not allowed me to enter dubai.. we are thinking if what is the reason.. i experience lots of trauma so i decided to go back in my country.. here, i applied visit visa again but it appeared to denied,reason is i have absconding case with lifetime ban.. Sir, my question is how it is happened? i dont know if it is the old case or new.. i ask my employer but he told me that he didnt gave me ban.. what should i do? I still want to come back in dubai and work.. pls. help me what to do.. thanks..
my friend was working in a company, he was terminated together with other colleagues, the company cancelled their visa from their own pocket, and not received 3 months salary, fortunately when hee asked for the NOC the company provide it and give it to him. He wasn't able to go to exit due to lack of cash. From the time he go for exit. We cannot get him a visit visa because travel agency told us he is ban and has a lifetime ban, he cannot enter UAE due to lifetime ban, when we asked from Al Rafa police station his status because we think it is from Bank that gave him problem, we provide a clearance letter from the bank, and showed to the police, but the police told me that his company give him a problem and put lifetime ban. When go to Immigration to ask what is the reason and how we can lift the ban, they only tell us that only relatives can go and inquire for the reason, as far as my friend is concern he didn't commit any crime or worst case to put him into a lifetime ban. My friend wants to return and work here in UAE, he was working here for 15 years and this is the first time he got a case like this. Can you please help us, may God will give his wisdom to you to serve others in need. This is Nafees Fatima, I have been to UAE in 2014 on a job visa as HR Coordinator, from Rixos Bab al Bahr, a 5 star hotel in Ras al Khaimah. After a month in medical examination they said i have TB and sent me back with a lifetime ban by taking my eye scan and finger prints. After coming back to my country, India, Hyderabad, I went for checkups and found that I had infection in my spine (L1 and L2), which was non-contagious. I took treatment for 2 years since spine needed a longer time to recover. My husband is working as a security guard in Ras al khaimah and I also wish to come back and stay with my husband. It has been more than 2 years and now I am fully recovered. I have got a medical certificate from the doctor and I have also done UAE attestion on it. Can u help me in any way clearing my lifetime ban and come back to UAE. Please reply. Sorry I forgot to mention one thing, I have seen some changes have been made in the UAE law in Feb 2016 for TB patients, as they don't have to leave the country and will b diagnosed for a year and close relatives can get visa to come back even after a ban and so on. Can u please chk if anything can be done in my case. Before i leave i check from labor if i have any case and i came to know that my employer put me on absconding case. now i want to know how can i rid off from this case. Hello! I was caught drinking and driving while on job. Due to this I was terminated from company and meanwhile I got another job. As my new company was just starting up, they took some time to get my visa. Meanwhile I overstayed from March 03, 2016 and on May 09, 2016 the FreeZone authority filed absconding case on me as requested by my previous company. After all odds i got NOC letter from company but then due to delays due to holidays and trade license renewal it almost took for me to request case lifting on July 04, 2016. I have all proves that all the time I was in touch by emails and also phone calls. hello...i am a filipino...in dubai...i have problem with dunia....100,000 dhs now...my passport are held in jebel ali police station...now i am terminated from work...and looking for new job...how can get back my passport? ?thanks..or can i still work? ?...or how i can cacell my visa if i have new job?? Hi.. I just want to ask regarding my problem.. I have absconding case 1yr now already.. I want to go back home in my country? What shall I do now? Any advice for this ? Just go to Al Aweer and get your outpass then visit your Embassy. Also make sure to get your ticket for fast procedure. Any one know how can we check our name black listed or not? 1. Can they put me abscond even i already resigned? 2. Should i get my passport and leave uae?? What is the consequence for me?? My name is mike from phils. i just want to inquire regarding my case in dubai. i used to work in atlantis the palm (freezone) that was year 2013, then after 10 months i went for vacation (2014) but due to emergency i couldnt able to comeback in atlantis. My manager called me and i told him the reason. Its been 2 years back since i left dubai. My concern is am i allowed to get a working visa if i got a new employer? i will not face any problems in immigration and MOL? cause when i check my visa status it showed invalid. please i need your help and answer. thank you so much! Hi I was a working in Dubai from Jan 2015 to June 2015 in an LLC firm and I was terminated from the job and my visa was not cancelled for 45days I waited and their was no response from my sponsor and I was totally a bankrupt with not even a single dirham in my pocket.. and due to all these problems and my father's health issue I flew back to India and now after an year when iam trying to get back to Dubai my visit visa is not geting processed because it's showing my residence visa is active... And now when I contact my previous company they are telling me they have listed me absconding and have put me a ban of 5yrs how can I get out of this??? good day..i am a filipina and applied for the amnesty way back in 2012..can i still come back to dubai for a visit visa or husband visa? I have been terminated by my employer without salary and i filed case against him in labour court. I won the case and my dues the company will have to pay as per the verdict but he filed appeal in court. It almost took 7 months to finish 1 case and again appeal was put for which i couldnot wait in UAE to get this finished as had no job there thus i had to leave UAE after first hearing because the employer was not in favor of cancelling my visa or give me my dues. The employer filed absconding for me. I was also not in talking terms with the company. Is there any possibility i can get this absconding removed ? My residence visa duration also finished. Can i apply tourist visa ? Just want to present my case. I left my company in Dubai for a vacation then i decided to resign via email, a week before my alotted vacation days. The HR and manager did not reply and I askedsome colleagues and it was confirmed the Unit Managet and the HR recieved my email resignation. Question is : will i have a ban or abscondimg case?if yes,how long and how can I remove it? I keep on emailing the HR,even asking then for a certificate of employment and they are not answering it. AS PER MY CASE IS CONCERN, MY PREVIOUS EMPLOYER FILE AN ABSCOND CASE AGAINST ME, HE ISSUED A CANCELLATION PAPER AND A NOC TO ME BUT HE DIDN'T RELEASE MY PASSPORT, SO, WHEN I ALREADY HAVE A OFFER LETTER I PRESENTED TO HIM HE TOLD ME THAT HE WANTS TO SEE THE E-VISA BUT THE PROBLEM IS ITS UNDER PRE-APPROVAL AND HOLIDAY COME SO IT WAS BEING DELAYED. MY LAST DAY SUPPOSED TO BE IS SEPT. 20, 2016 THEY APPLIED MY VISA SEPT. 22, 2016 BUT MY NEW EMPLOYER PAID ALREADY MY OVER STAY BECAUSE MY CANCELLATION INDICATED "NEED TO LEAVE THE COUNTRY OR CHANGE STATUS" SO MY NEW EMPLOYER DECIDED TO JUST MAKE CHANGE STATUS. I FILED A COUNTER COMPLAINT REGARDING THE ABSCOND CASE AND THE IMMIGRATION PROCESS MY PAPERS AND ASK ME TO PAY FOR THE AMOUNT OF 1, 080 FOR ALL SERVICES FEES AND FOR REMOVING MY CASE. BUT UNTIL NOW WHEN I WENT TO THE POLICE STATION JUST TO GET DISAPPOINTED TELLING ME THAT MY CASE HAS NOT BEEN REMOVED IN THE SYSTEM OF IMMIGRATION. MY VISA BEING DELAYED BECAUSE OF THIS. WHAT SHOULD I DO? AND MY PREVIOUS EMPLOYER DIDNT SURRENDER MY PASSPORT TO THE IMMIGRATION. THEY ALREADY GIVE ME PERMIT FOR OUT PASS. it's me Mohammed Faiz from India. I was working for a firm in dubai from Aug 2015 till Oct 2015 which is only three months, I was in my probation period but due to some family reason I came back to my home country,and while leaving i informed my co and they granted me a leave for 10 days but later the things got serious and I never went back to uae and I've also informed my firm that there is very less chance of mine reutring back. if yes then how can I lift it the ban and abscond. and how can I check my name in emigration whether my visa is active or nnot? ive been married to a emarati but before getting married to him i tell him that i hve a life time ban in uae but still we did get married he bring me in dubai last year of june but under khafala thats why i enter dubai again january this year we went back to my country for vacation and i cant go back there cause of absconding case and im in lifetime ban can you answr me if theres a possile way to remve my ban cause he need someone with him cause of hi medical condition!!!!!! my Husband Mr Junaid Malik . as he was in UAE on Employment Visa . after cancellation of his visa he was on over stay for 22 days . so he had to pay 22 days fine at the time of Exit country. but when he was going back to Pakistan on airport he went to pay fine on immigration counter the person available informed him that his fine is not showing on system he tried to check so many times and then he rudely said no fine showing .. then my husband went to Exit Counter and told him no fine showing he mark Exit stamp and my husband left UAE . Now I am Applying his visa it is getting rejected because he is blacklist on system as per Fine which he did not pay . please help us in this case what we can do . how to remove black listed . I am 2 weeks overstay from visit visa today. so my travel agency want to file an absconding to me . but i am going to exit this October 12. Tourist/Visa possible have a case absconding ? I was tell them that I am going to exit this October 12 but they said I need to exit today or less they file a case. What I am going to do . I apply oman visa and my exit is October 12. Somebody help me. I was jailed for 1 year in sharjah Central Jail and i was deported last june 23, 2016. I just need to know if i have ban or blacklist. Thank you..
6) how there put this case ill investing that time only i know there do illegally put this abounding case . I need some advice regarding the case of my friend, she have absconding case and almost 2 years without valid visa, also her passport is in immigration and already expired last year, now she wants to go back home, she would like to know if she surrender in al aweer is it possible to get an outpass without imprisonment or anything need to pay like overstaying etc.,pls. advice. thank you. I am having a false absconding case by my employer. Due to some unfortunate losses and a false case i was told by my employer verbally not to come to office and finish my issues . I have chats and emails also informing them about thr status of my case in the dubai court . But suddenly before ny visa expire one month before my employer filed a abscinding case on me in labor . When i told them its false and i wasnt absconding they said that i didnt inform them . Which is a lie. They complaint in labor saying that i didnt attend office from july 2015 and they filed a co plaint on me in may 2016 . What i am suppose to do now ? Please advice . i would like to share my case and whomever can give me an advice or help please let me know. I'm from Philippines. I work before in jeddah saudi arabia, I've work for one year and four months. and i pay my ticket on my agency just to go home. That was year 2013-2014. then at this moment I apply for UAE and my employer find that im blacklisted. Can anyone give me reason why im blacklisted in UAE? I want to remove my mother from the blacklist as she was found out having old TB last 2010. I tried applying for her visit visa last 2014 and it was rejected because she is blacklisted. She has scar on her lungs but not an active TB. Please help me on how to remove her from the black list. So she can visit and stay with my kids here in Dubai. Dear Sir,i was working in Dubai for 1.5 years.After getting new job i resigned and company cancelled my visa and i exit uae.Then my new employer applied my visa,it rejected due to security reason.i enquired a lot why this happen since there is no police case or nothing whatsoever under my name.Later i found that there is a wrong case under my name in abhudhabi.The date of that case is three months after i exitted from UAE.I am shocked how his happen.How there will be a case registered while i am not present at that thime in UAE.Please help the way to clear this issue. I am working in dubai last 2008 until 2012.i resign in my previous company and join to the other company.the problem is the new company were i join has not arrange my status.my previous company give me an absconding case because of that.and now i want to come back in dubai i already begging with my previous company before they give me a chance and they also give and realease my noc from them my question is it possible to clear my name in al awir immigration? I have resigned from my work and then cancelled my visa but the company told me that I need to exit the country or they will file an absconding case. I want to ask if they filed the case how can I exit the UAE? I am under the impression that if I have an absconding case and I try to leave the country, authorities will detain me? Is that correct? If so, how can I avoid this? Do I need to have the case closed or lifted? Im harbyjen, i work in abu dhabi as housemaid march 2013 to may 05 2015..i go vacation 3mnth before my visa expire.AUGUST 19 2015 will be my visa expiration.i didn't come back..my boss cancelled me sept 2015 but file me absconding..how to remove that absconding case and can i apply visit visa?? My husband has been filed absconding case from his company because he had to overstay after cancelling his visa due to my visa. I was on husbands visa and when I changed my job , My new company took 1and half months for my new residence visa so He could not exit to his country at that time. We also informed the company but they wouldn't listen to him telling him to exit right away which we couldn't but when he tried exiting next time, the immigration at the airport told.him, he was filed an absconding case. When we went to Al aweer, they asked for release letter which we requested from head office but they wouldn't issue it. Please tell us what to do. He is here in Dubai, we are ready to pay the fines but want to remove the case as well . please do advise us in trejor.tresh@gmail.com. Hoping for your positive response. Rishal - my brother have lifeban entry in the UAE , how can I lift that ban and what is the process? This is faizan waheed from Pakistan I was working all ahlia gulf line coca cola I was have road axidant on duty in sharjha I have all medical reports sharjha quati hospital so doctar give medical leave for 1 month I am rest my room company put me runway apsonding case and 1 time I am outside police coach me and puting the jail so now I am in Pakistan this labours lows uff my god ok if you have any opinion for please tell me . I want to ask if the employer still have right to file abscond to their employees even the company terminated him and already cancelled his visa. I would like to seek for your help, my previous employer filed an absconding case on me even though i was told to resigned hence rendered my resignation letter to them. Because of the case i wan not able to get a new employer and now on an expired visa and passport yet to expired as well, went to the extent of asking my previous manager to settle the issue between us but he was not responding and no interest of cooperating. Right now sorting it out with Labour. can you please advise on how to handle such situation. Also would like to know how is it going to be with the labour after having an schedules date for a meeting? how long will it take? what are the necessary question would be asked and action that needs to be taken? and what is going to happen to me? and what worst can happen? Would greatly appreciate you help. Hoping to hear from you the soonest possible time. I had to leave UAE during the financial crisis in 2009. I had a credit card and I signed an agreement to settle it once finding another job, but that job didn't last for 4 months and couldn't find a job after that. Hence I came back to Sri Lanka. How can I find out whether I have a case against me or ban against me? Please help as I badly need to come back to UAE n start living a good life. My husband had started a company with his partner before 5 years . My husband was the working partner and other partner was sleeping partner who just invested money his name is nowhere in the agreement as he had other companies. His mother name was there in the agreement as 51% share holder and now the mother also passed away . All the money handling process was done by the partner and my husband just trusted him blindly as they were friends for more than 20 years . my husband took loan from banks in his name and gave the money to the partner to rum his business . The company went through loss and my husband couldn’t pay installments when asked to the partner he said will arrange shortly like that it went for more than 6 months . last Dec.15 the sponsor and the partner asked my husband to leave the country as the banks were chasing becoz they had not paid the loan . the partner assured my husband that he will arrange money and call him back but it is safer to be out of country rather than be here. Trusting him my husband left the country and its been a year now the partner is not answering calls he has even changed the company name and running the business in other name . The partner and sponsor is not even calling him and neither answering his calls. I was there for 5 months and had to come back as I was on his visa . His visa was investors visa. When I called the partner he told I can’t do anything if your husband wants to comeback let him but if police catches him it’s not my problem. He even changed the company name so that bank people will not be able to reach.. My husband use to sign cheques and partner use to take money. He just trusted him blindfold. Now we both are not there. Please advise if there is any solution for us to come back. Good Day Sir. I gave a notice already that I will quit my job and go back to my country (Philippines). It will be my 1 year in work this december 2016. Do I have to request for a cancellation of my visa before leaving the country (UAE)? Please give advice, I don't want to get any trouble coming back here after 2-3 months. Thanks in advance. Peace! I have cleared the debt from the bank, and i have the clearance letters. But there is still a police case open against me. What is the best way to clear this matter? Can i fly to Dubai and submit the letters at immigration at the airport? I wish to understand if there is a way to remove blacklist due to Family court ruling. The judgement was passed when I was leaving (resigned from sponsor) and dont know what was passed. Now I am trying to enter but looks like life long ban? I was working for lifeline drug stores based at Abu dhabi. I had some issues with some banks and was imprisoned for 50 days in jail. I was released on 27th May 2016 and after getting my passport released from the honorable court , I had submitted the same at my company on 8th June 2016, for cancellation. They collected my passport and emirates id and gave it back to me after 2 days and told me to go to any police station and submit the same. The company had not given my final settlement too. While in Jail my visa got expired. I filed a complaint at labor court on 22ndJune 2016 and I got the final decision on 1st August 2016. But , in between the case the company filed an absconidng case against me on 11th of july 201. I dont know what to do next and somehow i want to reach back home to meet my ailing parents. نقدا، الأعمال التجارية، والنقدية خاص، نقدا سيارة، والنقدية فندق، نقدا طالب. I have a query about clearing name in black-list, which has been wrongly put into the list. I am a resident of GCC and uses to visit UAE every once in two months to visit my family (brothers) as I was having visa on arrival facility being a GCC resident. However since now the GCC residents has to apply visa on line on ednrd.ae & i have applied for visa in the month of May 2016, which got rejected. As Sharjah Aiport was still providing the visa on arrival till 10th June 2016, I travelled to sharjah and availed the visa on arrival facility. My last entry into UAE was 05 June 2016 & exit on 07th June 2016, since then I am applying for visa via ednrd.ae / Agent in Dubai but failed to get the visa reason stating Blacklisted as per my agent. My Brother had applied visa again from his company as he works in hotel industry which also got rejected for the same reason. I would appreciate if you could advise me how to clear my name from black-list which has been wrongly added by the UAE immigration. well sir i hope i will get reply from your side kindly could you please let me know that if i have bank cases on me and i am absconded as well....am i allowed to enter any other GCC country and allowed to work over dere and on top i was nt having a huge cases frm bank its about 100 thousand only and i am ready to pay back the amount to the banks but after 2 year pass through banks put lot of interest on my actual loan amount please i just need to know as if UAE goverment not allowed me to enter uae Can i move to any other GCC country to work. waiting for your kind responce. I am on my probation period and can i resign with in my probation period giving them a notice? what will be the consequence? Thanks for sharing this extremely informative article on list of shipping companies in Dubai. I recently read about list of shipping companies on website called aiwa.ae. I found it extremely helpful. I would request your expert advise as i left uae like 4 months back after resigning from my job and cancelled the visa n flew. Now i had some debt like credit cards n car loan to be paid. My question is if incase i apply for visit visa to dubai will it happen so i can go there n surrender n pay the penalties to atleasr remove the police case. I have absconded case my sponsor file against me due to I cancelled my visa after finishing my contract, in that time my sponsor told me you leave the country within one month. But that time I have one cheque case in police station so I couldn't leave the country. so I request you to give one solution how to remove the police case and absconding. I have something to share about whats happening with me right now in dubai. I have a police case come from the real estate worth of 26,000 dhs. Now im going to renew my visa last october 25th 2016 and the bad thing is because of my police case they didnt renew it as he immigration stop it. So from November 15 up to now this date i not coming to work because i dont have visa i didnt receive any salary or anything from the company. Now the real estate is forcing me to pay the amount i am trying to ask them to cancel the case just to renew my visa then im going to pay partially but they dont want. Now my company is telling me that if i will nit settle this then its gonna be a big problem for me as they will terminate me. Now my question is if i will be terminated my real estate case will be gone or i still need to pay?